“(1) I appeal to you therefore, brothers, by the mercies of God, to present your bodies as a living sacrifice, holy and acceptable to God, which is your spiritual worship. (2) Do not be conformed to this world, but be transformed by the renewal of your mind, that by testing you may discern what is the will of God, what is good and acceptable and perfect” (Romans 12:1, 2, ESV). “For you were bought with a price. So glorify God in your body” (1 Corinthians 6:20, ESV). “(7) But whatever gain I had, I counted as loss for the sake of Christ. (8) Indeed, I count everything as loss because of the surpassing worth of knowing Christ Jesus my Lord. For his sake I have suffered the loss of all things and count them as rubbish, in order that I may gain Christ (9) and be found in him, not having a righteousness of my own that comes from the law, but that which comes through faith in Christ, the righteousness from God that depends on faith— (10) that I may know him and the power of his resurrection, and may share his sufferings, becoming like him in his death, (11) that by any means possible I may attain the resurrection from the dead“ (Philippians 3:7-11, ESV). http://www.2043ad.com/journal/2007/02_ma_07.pdf%5D in Faithbuilders Fellowship (“Journal” section) March-April 2007. 1. The first application — is for the consecrated class, those who accept Christ now, and accept Jesus’ invitation to self-denial and cross bearing (Hebrews 9:24). 2. The second application — the one for all the remainder of Israel, shows that after this age for the consecrated, another age of redemption follows. This will be for the remainder of the world those who will be blessed by the saints when, as a class, they are complete in glory with Christ. Now we see that Jesus’ death, by itself, did not automatically bring release from the curse. Jesus was raised from the dead with the value of the Ransom price he provided, and by God’s design Jesus himself is the one who applies the value of the Ransom. He applies it first to us who consecrate our lives now, and later to the world during the Millennium. Jesus died for our offences to provide the Ransom value and was raised again for our justification to apply the Ransom (Romans 4:25). All for Jesus! all for Jesus! All my days and all my hours. Let my lips speak forth his praise. When Mary D. James was 13 years old, she began teaching Sunday school in the Methodist Episcopal church. She became a prominent figure in the Wesleyan Holiness movement, assisting Phoebe Palmer, and often leading meetings at Ocean Grove, New Jersey, and elsewhere. She wrote about 50 hymns, and articles by her appeared in various journals and newspapers. As of 1895, Hull was a music publisher in New York City; his company was still operating as of 1910. Here are some free online articles in relation to the Heavenly Father—Jehovah and his Son—Christ Jesus—“a ransom FOR ALL… to be testified in due time” (1 Timothy 2:6), as well as, about the holy Spirit (the understanding of God) with clear explanations about why the anti-Christ teaching of “the trinity”—introduced by the Roman Catholic Church system (the “Beast” in the Book of Revelation) —is not what the Bible teaches. The Bible Students Movement does not support the teaching of purgatory nor does it support the Roman Catholic System’s teaching about people being sent to a place where they burning up forever which certainly does not reflect the perfect love of God — the Almighty Creator of all things. Br. 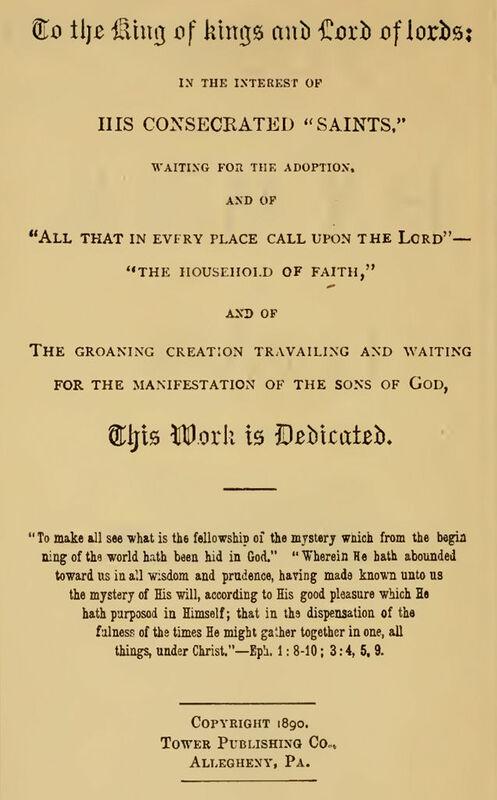 Charles Russell — the founder of the Bible Students movement, who is the compiler of “Poems and Hymns of Millennial Dawn.” With the assistance of Maria Frances Russell (1850 – 1938) — the former Maria Frances Ackley (whom Russell had married in 1879) — this Bible Students’ devotional was published in Allegheny, Pennsylvania (USA) in 1890. It originally contained a total of 151 poems and 333 hymns. “Hymnary.org” and “Wikipedia” — hymn history content. Links and Bible Resources. BIBLE Students DAILY. Converse with them while as through their efforts they do the Father’s will. Here you will be fed with the waters of eternal life. That Christ’s mediatorial kingdom reign, is on its way. Is understood by the called ones of GOD who trumpet the message of the Divine Gospel. They seek to encourage the feet members of Christ that remain—who are their glory and crown and gain. To daily learn the lessons, and become Christ’s in thought, word and action. They hope for and await the Heavenly Father’s “well done, good and faithful servant” reaction. They find comfort from feasting on the carcass of GOD’s Truth. Encouraged by prayers and supplications of their brethren in Christ and strengthened by the holy Spirit—a gift of GOD’s grace. Thankful in all, they remain as palm trees “tall”—in steadfastness and patient endurance until death. Why pray for them that belong to Christ? Because prayers of the righteous avail much. Conforming to the standards of GODly righteousness—seeking to sacrifice in all and do what is good, true, and right. When close to the fully consecrated in Christ we keep near. Let us keep close in the spirit of Christ together. Between some, this may mean silence now—but only for a while. EL SHADDAI most, as HIS name you boast. Please keep feeding the remaining few, for this is the commission in Christ—yours to do. Have a sanctifying effect on the consecrated unto the Lord, and upon all who have an ear to hear the wonderful words of life. Striving to be loyal to our covenant of sacrifice and to Christ forever belong. For we see Jesus in you—your knowledge of the Truth shared and your kindness and hospitality towards all, done. “Endure everything for the sake of the Elect, that they too may obtain the salvation that is in Christ Jesus, with eternal glory. What Does Being Consecrated to the Lord Mean? No more misunderstanding; no more silence. Eternal journeys with our Beloved Christ. But patiently enduring and persevering with JOY in the spirit. Today’s discomforts of the flesh—are experiences worth more than gold. It is through suffering, that our Beloved Jesus learned obedience. That same narrow path, we must follow too. Learning to obey GODLY principles willingly and change into the likeness of our Lord, Jesus. HE SHALL give you the desires of your heart. Seek till you find… till you win the race of the High Calling. Precious promises shall be fulfilled. Shall be together with their King. In their perfect everlasting home—where there is glory, honor and immortality. And I too hope to meet you there, when my sacrifice is complete. (31) Instead, seek his kingdom, and these things will be added to you. (32) Fear not, little flock, for it is your Father’s good pleasure to give you the kingdom. (33) Sell your possessions, and give to the needy. Provide yourselves with moneybags that do not grow old, with a treasure in the heavens that does not fail, where no thief approaches and no moth destroys. (34) For where your treasure is, there will your heart be also. (36) and be like men who are waiting for their master to come home from the wedding feast, so that they may open the door to him at once when he comes and knocks. (37) Blessed are those servants whom the master finds awake when he comes. Truly, I say to you, he will dress himself for service and have them recline at table, and he will come and serve them. (38) If he comes in the second watch, or in the third, and finds them awake, blessed are those servants! ACTS 23:6—HOPE & RESURRECTION. Part B: Will Mankind Resurrect With the Same Mind? Do you placed your life entirely in God’s hand alone? Do you kneel down, honor Him, praise Him, and thank Him? Do you block the bad, and surrender to the good? Do you give up your wants and accept our Creator’s ways of meeting your needs? When we shall be forever with our Lord. Disappointment, grief and fear become buried as if beneath earth’s surface, as we live FOR Him. Sorrow is blurred and Jehovah’s perfect love restores to us the purest joys. Christ and his Bride on the throne, and the companions before the throne. Lean on every holy word now as you fight the good fight of faith to the finish line. There is not long to go, but enough time for the faithful to be more than over-comers. Let your entire hope be found in God’s Precious Promises. Find perfect rest in that which is permanent and eternal. The more you seek the Lord, the more you’ll find Him. God’s holy words are in the Bible. Saturate your mind by them. Have you laid your burdens down before the Heavenly Father? Have you asked Him to show you the way just for today? Do you feel He is pleased? Please Him. Please, please Him. Do you cast all your cares on Him? Your cross then becomes lighter. Do you daily surrender your will entire into God’s hands? Do you wait patiently and cheerfully for His answers? Whether in the silence or in the noise, God always gives the perfect answer. Continue to place your ALL before our Heavenly Father’s throne. You won’t regret it. Bringing loving justice to all mankind, and helping all to walk up the Highway of Holiness and bring pleasure to our Creator, who is the ALL IN ALL. SURRENDER YOUR ENTIRE WILL and SEEK JEHOVAH’S WILL IN ALL and you will find perfect happiness for eternal eternities. THE HERALD OF CHRIST’S KINGDOM — monthly magazine. The Herald of Christ’s Kingdom is the official publication of the Pastoral Bible Institute, and has been published since 1918. THE DAWN BIBLE STUDENTS ASSOCIATION — monthly magazine & literature/articles published on Christian living, doctrine, and current events. The “Frank and Ernest” radio program continue to be aired by the Dawn as does “The Bible Answers” TV program. BEAUTIES OF THE TRUTH — a beautifully insightful regularly published (every 3 months) publication which shares scriptural viewpoints thought to be harmonious with God’s Plan of the Ages. This magazine is a hidden gem for the serious Truth Seeker, Ambassador of CHRIST and Bible student and scholar! THE PEOPLE’S PAPER — a 12 page (A4 size) periodical published four times each year (January, April, July, October) by the Berean Bible Institution Inc., Australia. BIBLE STUDENTS DAILY — Here on BIBLE Students DAILY, new posts are shared regularly, with the Home Page displaying the most recent post shared with Readers. WHAT PASTOR RUSSELL SAID — This book consists of hundreds of questions and answers by Pastor Charles T. Russell only, covering about twelve years of the Convention Reports and several years of the Watch Tower. Wherever a question is from the Watch Tower the letter (Z) follows the year. Otherwise it is from a Convention Report. STUDIES IN THE SCRIPTURES & PHOTODRAMA OF CREATION — In 31 different languages. OVERLAND MONTHLY, PASTOR RUSSELL’S SERMONS & OTHERS RESOURCES — Web books containing: Berean Studies, Exceeding Great & Precious Promises, Expanded Biblical Comments, Hymns & Poems, Manna, Overland Monthly, Question Book, Sermon Book, Songs in the Night, Topic Index for Studies in the Scriptures and other helps. TIME & PROPHECY — A Harmony of Time Prophecy with history and Archaeology. July, 1995, by David Rice. THE STREAM OF TIME — Bible Chronology & Time Prophecy. August 2002, this edition January 2004 by David Rice. THE APPROACHING END OF THE HARVEST — 6000 Years from Adam; Closing at the End of the Harvest; Anticipated with the year 2043 — Additional Evidence; Structure and Design; Concerns Addressed; February 2016, Faithbuilders Fellowship (DavRice@aol.com). PILGRIM ECHOES — Web book by Benjamin Barton. ZECHARIAH — The following exposition comprised a series of articles from 1968-1970 in the journal titled “The Bible Study Monthly” by Albert O. Hudson, of Milborne Port England, who was a faithful Christian, Bible Student and Scholar of the twentieth century. He was born in 1899 and died in 2000 at 101 years of age. NOTES ON THE PASSOVER & THE MEMORIAL — By Anton Frey. OUR WILDERNESS WANDERINGS — Anton Frey: lessons from Israel in the wilderness. THE LAST WEEK OF OUR LORD’S MINISTRY — With scriptures and reprint articles for each day fully printed out. ECHOES OF THE PAST — Web book by Norman Woodworth. THE GARDEN OF EDEN — An examination of the story of Adam and Eve. Albert O. Hudson, England written 1959-1960. THE STORY OF THE DELUGE — Biblical, geological and historical account of Noah, the ark and the deluge. Albert O. Hudson, England written 1974-1976. AFTER THE FLOOD — History, archaeology and symbolism upon entering the new world. Albert O. Hudson, England written 1984-1986. KING DAVID OF ISRAEL — The life and times of a man after God’s own heart and a fitting symbol of a greater throne. Albert O. Hudson, England written 1982-1984. THE KEYS OF REVELATION — A verse-by-verse explanation of the Book of Revelation by Frank Shallieu. EZEKIEL’S VISION OF A NEW TEMPLE — An examination of various features of the vision and how it beautifully portrays the establishment of God’s kingdom on earth. By Edmund Jezuit. Daily Devotional Books (as featured in detail on this website). The Bible Resources App contains daily devotional material, bible resources and hundreds and hundreds of discourses by brethren world wide. This Bible Students’ CD Program is A GOLD MINE! It can be purchased from The Herald of Christ’s Kingdom Bookstore and it allows access to a huge variety of Bible Study literature to all the Books of the Bible. The search allows you to type in any topic, Scripture or word(s) and it will direct you to the source of literature you are searching for. RVIC – THE REVISED VERSION (AMERICAN EDITION) IMPROVED & CORRECTED BIBLE — from manuscripts discovered and published to AD 1999. The most accurate up to date English version of the Holy Scriptures available. GOD SOLE CREATOR – Web book. The first time all of these materials from the Old Testament and New Testament were assembled between two covers, was in the time of the Roman emperor Constantine (reigned 313 -337 AD). This formidable project was a gift to the church from Constantine and each word in Greek was copied by hand in the best penmanship available on costly parchment. This Holy Bible still exists today and is called the Sinaitic Codex. For ease of study and cross reference, bound pages (technically called a “codex”) were used comprising of animal skin (parchment), rather than employing scrolls. Translations of the books in the Holy Bible into every language spoken by Christians have continued from that day to the present. Physically, Codex Sinaiticus is located in four places: the 43 original sheets in Leipzig; a few remnants forgotten in the Russian National Library; the majority of the text in the British Library; and approximately a dozen sheets that were later discovered after an earthquake at St. Catherine’s. But the digital age has brought the entire manuscript back together in a virtual online museum at www.codexsinaiticus.org/en/. It was in 1844, that Constantin (von) Tischendorf (18 January 1815 – 7 December 1874)—a world leading biblical scholar in his time—discovered the world’s oldest and most complete disputed Bible dating from 325 with the complete New Testament not discovered before. This Bible is called Codex Sinaiticus, after the St. Catherine’s Monastery at Mt. Sinai, in the city of Saint Catherine, Egypt, where Tischendorf discovered it. Learn more about the controversy surrounding Constantine Tischendorf and his removal of Codex Sinaiticus by reading “Hero or Thief? Constantine Tischendorf Turns Two Hundred” by Stanley Porter in the September/October 2015 issue of Biblical Archaeology Review.